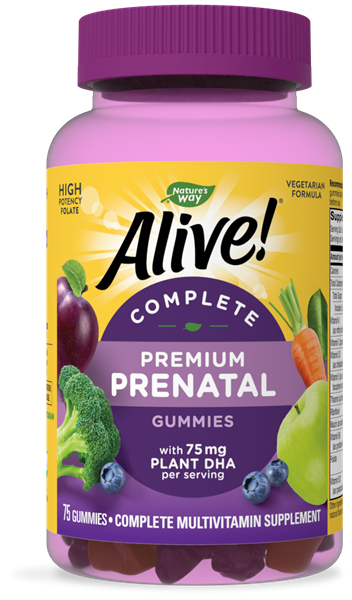 Alive!® Premium Prenatal Gummies are complete prenatal multi-vitamins that support you and your baby’s health from the start, with high-potency vitamins and minerals, plus plant-source DHA, all in a delicious gummy. Each daily dose delivers 14 vitamins and minerals, with 9 at 100% or more daily value, as well as 800mcg of folic acid and 75mg of plant-source DHA. Pregnant/nursing women chew 3 gummies daily. If taking any medications, consult a healthcare professional before use.